Both sides turn to diplomacy to resolve a conflict; Emily obtains a special visa; and Howard interrogates a suspect. 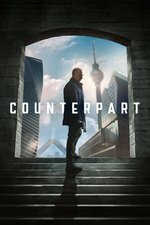 TV Fanatic review - It was the Emilys turn up at bat on Counterpart Season 1 Episode 3, and their story delivered! I sure wasn't expecting that ending. I had to laugh at myself for not realizing Emily-Prime’s comatose counterpart Original-Emily would have been employed in the secret agency too — without any conscious analysis, I just had her slotted into the ‘source of man-pain love interest’ category in my brain. Like getting stumped by the old “I can’t operate on him, he’s my son” brain teaser; internalized misogyny is a trip. Really liked this episode though, I think this is the workdbuilding info I was waiting for, those little details about the differences between the worlds revealed during the negotiations at the embassy, and the big reveals about the Emilys & Howards. It didn’t make sense to me before that the two Howards were so different. But now it seems clear that OriginalHoward’s lack of clearance/promotions in the agency were due to OriiginalEmily’s direct interference. And HowardPrime’s rise was strongly motivated by his bitterness at EmilyPrime’s failed attempt to do the same. Apparently I was the only person who suspected Emily's mysterious hit and run wasn't an accident. Good catch, miss-lapin! I missed it too, and was in the same space as oh yeah! It just seemed TOO coincidental that other Emily was a spy of some kind and this one was mysterious hit by a car out of nowhere with the added appearance of Other Howard. They had to be connected somehow. Other-Howard is a Badass. Other Emily (was) a Badass. Other-Baldwin is a universe-hopping contract killer. Prime-Baldwin is a harmless musician. Prime-Howard is Mostly Harmless, therefore Prime Emily is Mostly Harmless. And looking at that... I've been unconsciously conflating the prime universe with softness, and I think they want me to. This episode actually continues to push that perspective subtly, with how they missed a deadly pandemic that the other world is still reeling from. When I trust the writing team, I let go more, and am much more liable to miss a trick. So... I suppose I'm actually happy they were able to slide this one by me. Makes your catch more impressive to me, too. Any other notions you want to share? I hadn't processed it that way. To me it seems like....who takes out their pain internally as opposed to externally. Baldwin and spy Howard seemed to express their inner turmoil by being emotionally disconnected and outwardly hostile. The primes seem to "hold" pain inwardly to protect others. I don't think one is "stronger" than another, just different modes of expressing that strength and so people react differently. Yes, we already know prime world exploits other world for secrets that are more open in their world. In the pilot, when Howard attempts his interview for the Strategy job, Quayle first asked how his wife was, and then said that her "coworkers speak of her highly, although [he] had not met her himself". So the show let us know, subtly, that the comatose Emily worked at the [Unnamed] Bureau and that she worked at a higher level than Howard does. The show seems meticulous with this sort of detail. My theory at the moment is that the choice that split the Howards' respective paths was the other Emily's decision to disclose to Howard that there was a parallel world, or at least that there was something really important he didn't know. Emily says something to that effect when they were privately talking in the embassy -- something about how he could never get over how she once knew more about what was going on than she did. I think that, one way or another, was what split them up and provided the impetus for other Howard to move all the way up to Chief of Section 2. Unlike the Howard here. And this made the other Emily very sad, when she read the letter from this Emily to the other Howard -- she learned that this world's Howard and Emily remained very happily married, while Emily was "read in" and Howard remained ignorant. Anyway, because I caught the hint that comatose Emily worked at a high level there, I never believed that her accident was an accident. She's bound to recover from her coma, of course, since Olivia Williams is a major supporting actor. But I was very sad to see other Emily be killed. Note that she was their side's version of "housekeeping", just as the sullen Aldrich is on this side. While presumably both are primarily interested in protecting the status quo (which Baldwin and Pope are attempted to disrupt), this side's housekeeping seems a whole lot more ruthless about it, while Emilly seemed pretty naive. Which is weird. So this side's intelligence service is less active and there't (apparently?) not really an equivalent to their Section 2, but this side's housekeeping is hardline. The other side appears to be the inverse. It's just strange that we've not seen anyone on this side who is equivalent to other Howard -- he did mention, though, that this side's intelligence was a "shitshow". As punchable as Quayle is -- which is enormously punchable -- he seems to have consistently made the correct decisions, as opposed to Aldrich. Even if they killed or captured Baldwin (as they did), there's no reason to think that this would stop the assassinations on this side, they'd just get a new assassin. They absolutely need to cooperate with other Howard. However, Quayle is being a bit naive in just taking other Howard's word that he can't trust anyone else. Howard could be playing him, as Aldrich suspects. Quayle desperately needs allies on this side ... wait, that will be Emily, won't it? Finally, other Emily was very foolish is speaking aloud with other Howard about whose the action code was -- she already acknowledged that they were probably bugged and it was clear that they were talking about Pope, even though neither said his name. If he's the bad guy who tried to get other Howard killed and actually is the person behind Baldwin, then obviously he's going to kill other Emily for knowing this. Also, be suspicious when your light switch suddenly doesn't work. Just binged all theee of these off the DVR tonight. I’m left with so many questions. Like the prime side is clearly getting the better end of the deal, so why does the divergent side keep the door open? What are they getting out of it? Is that why they have a section 2 at all? What is Pope trying to do? Just trigger some kind of hostilities? Seems there should be more there than just a desire for revenge? He’s got to have a long game? So Divergent Howard came over because Prime Emily missed a rendezvous or something. He had to know all along that something had happened to her. Is he thinking of replacing Prime Howard? Clearly he loves Prime Emily, can we trust divergent Howard’s motives? Prime seems to have some better tech phones, but then the computers are green screen CRT? And dot matrix printers? Also, nailing down what year, when they were negotiating, census years for the US only up to 2011? Are the two worlds even at the same year? This was hinted at as being in East Germany, so it’s got to be after the wall fell on the Prime side, and hard to tell on the divergent side, maybe Communist because of the bar that Divergent Howard drinks in? I’m definitely hooked on this show, now to wait for the next episode. I think the only reasonable explanation of her recklessness is that she was isolated and desperate. Still sort of stretches believability a bit, but maybe she was seriously thrown off by her first crossing. Anyway I loved the peek into the why of maintaining the whole crossing, embassies, etc: trade, of course. But here's my question: Why do they want American census figures from the other side? When she talked about not folding him in I thought OtherEmily had swapped places with PrimeEmily sometime in the past and OtherHoward found out leading to their split. I thoroughly enjoyed the vaccine advert that went from upbeat and friendly (bring your family and friends to the clinic) to punishment, fines, and quarantine. I would pay to have this run in our reality. Bungadunga: to guage the severity of the pandemic? Why that's such a high priority, I don't know. My theory on the census data is to potentially track anyone who doesn't have a counterpart on their side; somehow those people could be useful? But the epidemic one sounds reasonable. Ahem, just finished the first episode and that was the first thing I thought. Glad it's getting good notices here, I'd just seen a promo and the first episode with no info at all was obscure and intriguing. My moneys on the assassin being a good guy freedom fighter. The vaccine ad was totally the German version of Scarfolk.